When purchasing our home six years ago, we loved the location and century-old woodwork. It’s the only home our twin daughters have known and we wanted to keep it that way. 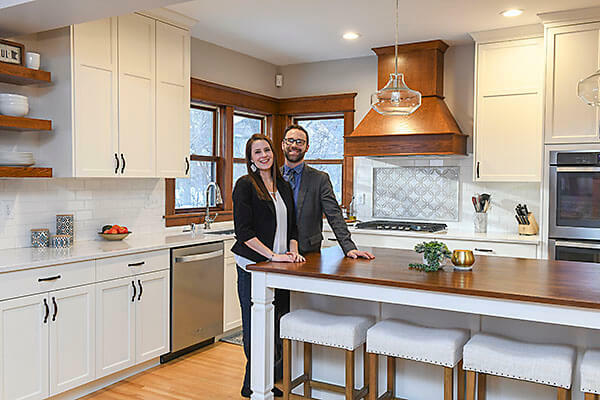 We realized with just a little more space and openness it could be our “forever home.” We sought a remodel that incorporated modern elements while maintaining the original components and charm from 1914. We knocked down walls from an existing office and kitchen to create a large kitchen and open flow into the dining room. We reused original doors and trim to blend the old with the new. We added a modest-sized addition that includes a mudroom, powder room, and office on the first floor; a master bedroom with his-and-her closets and a master bathroom upstairs; and an unfinished bonus room in the basement.